We have 13 copies left in stock. This title is out of print and cannot be re-ordered. FREE or minimum SHIPPING MAY NOT APPLY TO THIS TITLE. WE WILL NOTIFY YOU OF ACTUAL SHIPPING COST ONCE YOU ORDER. YOU WILL HAVE THE OPPORTUNITY TO CONFIRM OR CANCEL YOUR ORDER. Many of us have wondered, Is this really how my life is supposed to be? Maybe your life's story is marked by poor decisions or the hurtful actions of others. How can you turn things around? Is God even still interested in using you? The answer is a resounding "Yes!" Rewritten guides you through five life opportunities to exchange your story for God's story. When you become the person He designed you to be and accomplish the tasks appointed to only you, you will experience the greatest fulfillment you could ever know and bring hope to a broken world. Somehow we know: There is something broken, something wrong. Yet there is also something beautiful, something more. Bruce and Heather have captured the concepts of what it means to be created in God's image, what it means to have that image scarred and polluted, and how that image - our story - can be Rewritten and rediscovered by God's grace. This book will help you rewrite your story. - William Rice, pastor, Calvary Baptist Church, Clearwater, Fl. Inspiring. Motivating. Encouraging. Compelling. 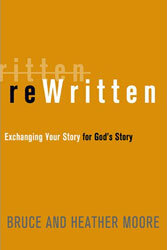 Rewritten engages and equips readers to embrace God's story for their lives. May God use this book to remind us all that we can trade our messes for His miracles in our lives. Use this book to help servers and believers understand the amazing story God wants to write through them for His glory. - John Cross, pastor, South Biscayne Church, North Port, Fl.